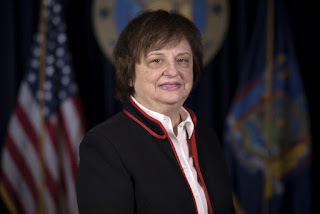 NEW YORK, N.Y. -- Attorney General Barbara D. Underwood and Governor Andrew M. Cuomo today submitted comments to U.S. Commerce Secretary Wilbur Ross and demanded that the U.S. Department of Commerce, National Oceanic and Atmospheric Administration, National Marine Fisheries Service, and Mid-Atlantic Fishery Management Council repeal and replace the unfair state-by-state allocation of the annual commercial quota for summer flounder, also known as fluke. The need for equitable distribution of fluke is critically important to New York's fishing industry and the state's overall ocean economy. "Relying on decades-old data to allocate states' fluke quota is unfair and unreasonable, and causes direct harm to New York's commercial fishing industry," said Attorney General Underwood. "Federal law requires the share of the commercial summer flounder fishery to be determined by the best available science. We will pursue all available legal options if the federal government does not address these inequities." "New York's commercial fishing industry has been constrained by unfair federal regulations, limiting the amount of fish commercial fishermen and women can catch and damaging our state's economy," Governor Cuomo said. "It's far past time for these inequities to be addressed, and our petition is clear: New York must be put on equitable footing with other East Coast states in order for this valuable industry to reach its full potential." In March, the Attorney General and Governor Cuomo jointly filed a petition with the federal government demanding that New York's commercial fluke allocation be increased because the current allocations are unfair to New York, not based on current data, and violate the Magnuson-Stevens Act. In response, National Oceanic and Atmospheric Administration, National Marine Fisheries Service published notice of New York's petition in the Federal Register on July 10, 2018 and invited public comment until July 25, 2018. Today, AG Underwood and the DEC submitted a letter to the federal agencies in support of the state's petition, and to point out and clarify that none of the commercial allocation options currently being considered by the Mid-Atlantic Fishery Management Council will provide New York with a fair allocation for summer flounder. Despite strong objections from New York's representatives, the Council voted to proceed with a draft amendment that does not include options that are fair to New York fishermen and women, and is therefore not compliant with the Magnuson-Stevens Act. If the federal government does not make the change to a more equitable distribution of quotas, the state will pursue all available legal options to obtain an equitable share of the fishery. "Through the Governor's leadership, we are fighting hard for our important commercial fishing families and we will not stop until we secure a decision making system that is based in science and does not put New York at a competitive disadvantage," said DEC Commissioner Basil Seggos. "While the Mid-Atlantic Fishery Management Council continues to ignore our call, we urge the federal government to act quickly on this petition and ensure an equitable quota system for all states." Currently, commercial fishing quotas are based on data collected during the 1980s and allow for more landings in southern ports. While New York is allowed just 7.65 percent of the total coast wide commercial landings quota for summer flounder, North Carolina and Virginia receive nearly 50 percent and New Jersey and Rhode Island get 17 percent and 16 percent, respectively. Current data shows that both the summer flounder stock and commercial fishing activity have shifted northeast toward the waters off New York since the 1980s and none of the proposals currently under consideration fully recognize these shifts.